These raspberry earl grey tea cookies are a tasty way to get a lift in the afternoon. 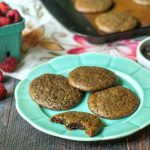 The raspberry and earl grey flavors make these low carb cookies the perfect match to a cup of tea. Gluten free, grain free and only 0.2g net carbs per cookie. If you have a spice grinder add the tea and grind into a fine powder. If not add to a food processor and process to a fine powder. Take out and set aside. Spoon into a mixing bowl, add the rest of your ingredients and mix well.